It is possible for churches to grasp the vision of movements and not bring systemic changes to keep it going. This is a call for taking an objective look in the stained glass windows of our churches. What is really going on? And how reproducible is it in the real world? Denominational loyalists are in trouble when the denominational leaders make idols of past traditions that have long become stale and ineffective all in the name of keeping an institution alive. And those trying to be loyal are the very entities that suffer the most. We hear of church after church starting in what appears to be a divinely-sparked spontaneous outbreak overseas, but none stateside. Western churches largely refuse to abandon their ineffective disciple-making systems when they are clearly limping along at best. Yet, it’s these systems that prepare the church for disciple-making movements when the Lord is ready. When a publisher told me that even though he thought that Bible Storying was superior to his organization’s curriculum-based efforts, he confessed that the financial bottom line did not allow him to do anything else but stay the current course of action. In other words, selling ink and paper trumped making disciple-makers. They were content at discipleship for the loyal few. Evangelism was somebody else’s business and they didn’t want to step out of their denominational assignment. Evidently a well-coordinated approach was long-abandoned. On a simpler level, we often see social changes in society that are deeper than fads and represent lasting movements – wearing seatbelts, homeschooling, smoking bans in public places, and many more. Facebook, Twitter, and YouTube are also examples of social movements that bring behavior (practices) changes, but not necessarily beliefs. Deep change in our culture is possible! But it requires blurring the lines between those who catalyze and those who maintain so that there is a seamless flow from one level of spiritual development to another. We have placed in authority of our churches the preacher/teachers of Ephesians 4:11, but where are the apostles, prophets, and evangelists? Movements are spawned by those who push the edges of lostness. And all five service categories in that church in Ephesus are required to work together to keep disciple-making movements healthy. The apostolic role is alive and well around the world and the other roles fall right into place as the Holy Spirit gifts new believers with all the functions that a church needs. Some churches have lowered the bar of accountability so low that just inviting the lost to church is considered praise-worthy. Or possibly just putting in a good word for Jesus, such as putting Christ in Christmas, is now considered a bold move and is highly praised in some places. Don’t get me wrong. Inviting people to go to church with you is important. Thom Rainer, LifeWay president and author of The Unchurched Next Door discovered, “Eighty-two percent of the unchurched are at least somewhat likely to attend church if invited.” A disciple-making movement may have to start with church attendance, but how much more effective to begin with sharing a relevant Bible story and expressions of care at the right moment in the life of a seeker? If we are considered “followers of Jesus,” then we need to accept the challenge to obey Jesus’ command in Matthew 28:18-20 to make disciples of all people who would obey His teachings; not “just” make converts. 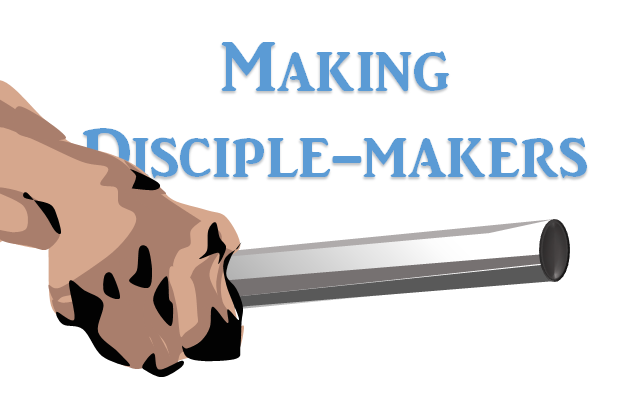 Paul admonished Timothy in 2 Timothy 2:2 to make disciples who could make disciples of others. For too long, evangelism and discipleship have been separated in our churches. Adults, youth, and children who are baptized or transfer in are just put in a small group with no intentionality. Movements require blurring those lines. Mark, I read with great joy your words on the need for us to lay down outdated traditions in order to move back to Jesus’ model of creating a movement by making disciples who will make disciples. And I agree with you that we need to reclaim, or appreciate, recognize and utilize the roles of apostle, prophet and evangelist. I once had a young Apostle tell me that the problem with the church in the west is that it is under the anointing of the pastor rather than the apostle. The pastor’s role is to gather, feed and protect his flock. That’s a good role, but if it becomes the dominate role (and it has in America) then we end up with over fed, well protected, and inward-focused flocks of sheep. The role of the Apostle is always outward looking. He is a father who wants to coordinate a cooperative effort which will utilize all of the dorea gifts to bring Christians to maturity so they can be sent out to make disciples, next door or among the nations. Keep those challenges coming, brother. Jesus is taking back His church.